Dozens of alpine cows appear to be committing suicide by throwing themselves off a cliff near the small village in the Alps. In the space of just three days, 28 cows and bulls have mysteriously died after they plunged hundreds of metres to rocks below where they were killed instantly. In each case, local mountain rescue services using a helicopter had to be called in to remove the bodies because of the danger to the local groundwater of pollution. A police spokesman said: 'There are no large carnivores living in the Alps anymore who would once have disposed of the bodies so they have to be moved. According to local reports, there had been violent thunderstorms in the area which may well have spooked the animals. Cows wandering at high altitude are a common sight across much of the Alps, where farmers let them loose to graze on the green plateaus above the villages. Often carrying large bells around their necks, most are dairy cows as the mix of vegetation and grasses at that high altitude are particularly good for milk and for making cheese. 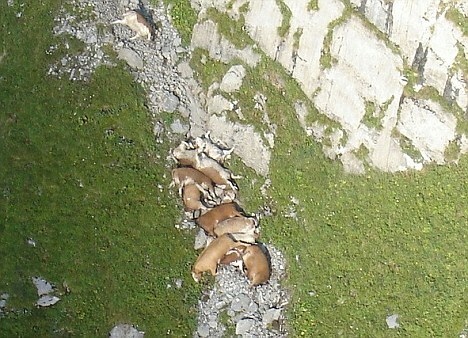 Cows do occasionally fall to their deaths in these Alpine regions although it is rare for so many to fall in one particular place. There has been speculation in the past that when this does happen it is because a tightly-grouped number have followed each other as they search for more grass. Most scientists generally believe that animals are incapable of committing suicide. Even lemmings, which by popular myth throw themselves off cliffs during mating season, do not take their own lives intentionally. Instead, evolutionary pressures cause them to feel the urge to change habitat at which point they migrate in huge droves. Sometimes, particularly in Scandinavia, they reach clifftops overlooking an ocean and, driven by the urge to cross a body of water, throw themselves off in order to swim to the other side. They often die of exhaustion or drown as a result. The myth came to the public's attention when a Disney wildlife film in the 1950s mocked up the lemming migration to make it look like the animals had committed suicide.